I captured this image of the Spurge hawkmoth during the celebration of National Moth Week 2013. Information below onDakota Naturalist.com events I attended during National Moth Week 2013. “A Second Evening with Moths,” with Dr. Jerry Fauske, Entomologist, NDSIRC/NDSU, at Turtle River State Park, Saturday, 8:00-11:00 p.m., 20 July; and we’ll go Night-lighting for Moths at the TRSP after Jerry’s presentation! I really enjoyed listening to Carl Barrentine who filled in for Dr. Jerry Fauske!!! “What Moths can tell us about the History of North Dakota,” with Dr. Jerry Fauske, Research Specialist and Collections Manager at the North Dakota State Insect Research Collection, Room 253, O’Kelly Hall, UND Campus, Thursday, 7:00 p.m., 25 July. Nice! So how's the 'mothing' coming along now that you've been fiddlin' with some new lighting, Sharon? Will you post your mothing images here on your website? Let me know. I'd eager to learn more about the moths of Buxton in the coming weeks! Are these normal in northern MICHIGAN?? 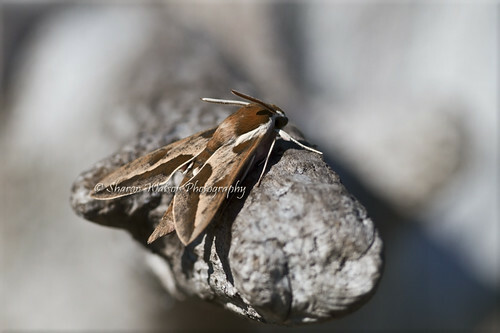 Congrats on your wonderful image of the Spurge Hawkmoth displayed on the MPG website Carl!!! The last two cats found in my pasture have shed their last skin the last couple of days and are pupating very slowing now. The wood shavings worked great and I have been able to observe the caterpillar during the pupating process. Its been exciting to see the life cycle of the Spurge Hawkmoth and I am looking forward to the spring hatch of the hawkmoths! Thanks for sharing the url Carl.